Flooring is sold by the square foot or square yard it is important to know how large the area is that you want to cover is the first step. It can be difficult to measure rooms that have odd angles. If you have an “L-shaped” room, divide it into 2 rectangles and measure them separately. The length of the rectangle multiplied by the width equals the square footage. For example, a room, or section of a room, that is 15 feet long and 12 feet wide produces this formula: 15 x 12 = 180 square feet. If the flooring you are purchasing is sold by the yard, divide the square feet by 9. So, 180 square feet / 9 = 20 square yards. You will then want to add up the square footage from all the rooms or room sections. That number will be the total square footage being covered. As a rule of thumb you will want to be sure to account for any waste. It is usually about 5% of waste. If you don’t have much experience with installing you may want to adjust that to a bit more waste. Remember you will have to cuts that you will need to make. Now comes the fun part!! You get to shop for the perfect flooring. 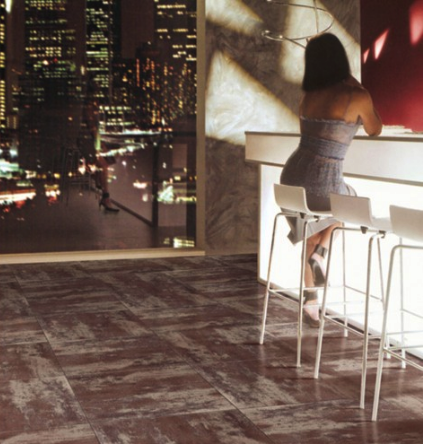 The price of flooring can start off at $2.00 a square foot to $12.00 and even higher. It all depends on the brand, quality and style. We have so many gorgeous ceramic, stone and glass tiles to choose from. The final step is to either install the flooring yourself or get estimates from some of the local contractors. The cheapest flooring to install is carpet and laminate. Vinyl and wood flooring are in the middle. Ceramic tile, stone and concrete are the most costly. Or you can install yourself. While you may save some money on installation costs it will be a little more difficult. You will want to research to make sure you are properly installing your tiles. If you have any questions contact one of our specialists at Plumbtile.